The American motorcycle magazine RoadRUNNER is famous for the advice it gives travellers through a long-lasting collaboration with its readers. Here is a taste, on three topics, that surely will also interest the visitors of our website. In the summer of 1999 Christian and Christa Neuhauser, both Austrian, decided to change life, with their two children. The chosen destination for this new adventure was North Carolina. The decision was made after a lot of time travelling by bike to discover the USA, which made the couple understand they had a certain aptitude to planning itineraries, reading maps, discovering new places. Their passion for travelling by motorbike transformed itself into a job with the birth of the magazine RoadRUNNER. This publishing project, rich in information for the bike tourer and with very high-quality photographs, was born in 2001 and is still well established to this day, supported by readers and the by motorcycle industry in general. Christian Neuhauser passed away in an accident in 2005 but his wife continues to promote the vision built with her husband without losing enthusiasm for the great family of motorbike touring. Her sons Manuel (Technology Consultant) and Florian (Marketing & Contributing Editor) help her along with a team of passionate individuals. The first visual clues of a tourer bike are the cases and the windscreen. Managing luggage and wind are important aspects to consider. Those who use their bike in urban areas or for short trips prefer not to have anything above their handlebars… or at worst a low screen. Those who instead clock up hundreds of kilometres a day, maybe at motorway speeds, absolutely need adequate protection from the wind: Travelling for many hours in these conditions means putting your body to the test, noticeably reducing comfort, probably modifying the correct riding position. If you are still not convinced of the need to fix a windscreen or consider changing it with a more protective model, here are some considerations, according to the different seasons of the year. RIDING IN COLD WEATHER – Without a screen it becomes incredibly difficult to compensate low temperatures with adequate clothing (which means layers of clothes or heated accessories). for example with an ambient temperature of 4° Celsius and a speed of 100 km/h, the cold air hitting the biker converts into a cold wind at -3.5°C. If your route takes you above sea level, even if only for a few hundred metres, the situation drastically worsens. The general rule is that for every 300 metres of additional altitude the temperature decreases by about 1.5°C. 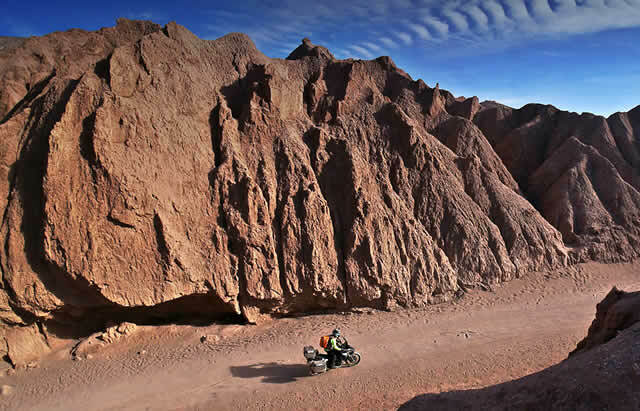 RIDING IN HOT WEATHER – Travelling without protection against the wind in very hot climates can have its disadvantages, albeit lighter compared to riding when the temperature is below zero. The human body cools itself (to keep a safe internal temperature) through perspiration. While it is important to have some air circulation to the rider’s body when it’s hot, a full-on direct windblast can be pleasant but rapidly deplete bodily fluids. MANAGING AIR FLOW – Nothing stops you from owning two windscreens, a bigger one, which can also protect your hands from the wind, and a smaller one for the hot season. In case of Tourers, which usually come with a standard windscreen, you will need to evaluate the offers of the aftermarket to find the correct alternative. There are models that allow to use the same original fixing points (which allows to easily and quickly substitute them). The most luxurious cruisers allow the electronic regulation of the standard screen’s height: this is very useful and can also be found on aftermarket models, with (manually) adjustable spoilers, there are even universal ‘mini’ spoilers (to fix on top of the main windscreen) , on which it is possible to modify the angle of inclination to direct the air With similar systems it is possible to protect your legs and the lower art of the torso. The question is subjective. If you absolutely don’t like seeing through a windscreen, even when it’s cold, the compromise is a heigh which allows the air flux to reach the area from the neck up. It will be noisier than the ‘tall’ option but with some earplugs and a good full-face helmet on you’ll be all right! In the States many bikers are in love with the ‘camping life’. We must add that this need to leave, fixing a tent, a sleeping bag and some equipment to the bike to live a few days in the wild has no break during the whole year. Steve Mauk tells the magazine of a fantastic experience lived in Pennsylvania and how he had underestimated how much the temperatures would decrease at night. To prevent other readers from making the same misjudgement Steve gives some useful advice. 1) Since it is not possible to carry too much clothes because of the space occupied by the camping equipment, it’s a good idea to leave wearing a technical tourer jacket with an internal thermal layer. It will be then possible to ‘lighten’ the jacket by day and make it warmer at night. 2) Two pairs of woollen long underwear work like a charm, even in the sleeping bag. 3) To avoid heat loss under this put a ‘survival’ blanket, the lightweight foil type that occupies very little space. 4)Do not forget a fire starter kit. Careful not to remain without firewood for the following morning. A small fire as soon as you wake up will help you get rid of humidity from the shoes and the rest of your clothes. A nice hot coffee will make you smile to the world. 5) Probably bikers who live outside the USA do not know that it is forbidden to gather firewood in the woods. Best to buy it before stopping, in the internal store,if you are in a dedicated camping area, or at a petrol station. The wood is sold in small easy-to-carry bundles. Average price is about 5 dollars. For those who travel by bike, losing the camera or smartphone is a real tragedy, often coinciding with the loss of the pictures and videos taken. Will it ever be possible to recover all those precious moments captured by a snapshot ? With two billion smartphones around the world, a billing digital camera and more than 20 million Go Pro video cameras, the possibility that a few tens of thousands may get lost during the holidays is physiological. No one wishes to find themselves in this situation, but if it should happen…here is what to do. 2) Grab onto your social channels and spread the word! The mass adoption of Facebook, Twitter and Instagram has really revolutionised the way of communicating and interacting with others. Your social media account allows you to access many friends and acquaintances, who will then be able to share your details and help you find what you’ve lost. It works more often than you’d imagine. Check hashtags such as #FoundCameraand see if someone has published anything from where you lost or think you’ve lost your device. If the lost device is a smartphone connected to Facebook, it is possible to check the location via your account security. Simply go to your ‘settings’ page and click the ‘security’ tab on the left hand side, this will bring you to a page with the option of seeing where you’re currently logged in If you see a red flag then it’s been stolen, but you will have the IP address of the device that will be easily traced by the relevant authorities. 3) Look for websites dedicated to losing objects, including cameras, video cameras and mobile phones. You will discover a worldwide network that is active in looking and giving back lost things. Register and leave your info. 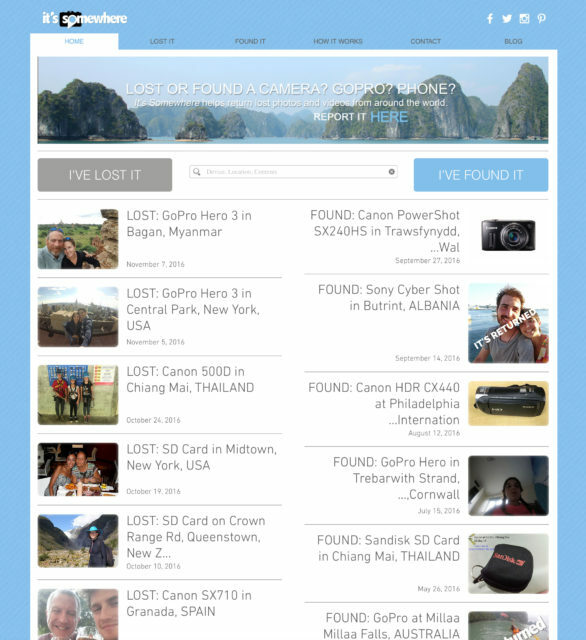 One of the most famous is called ”ITSSOMEWHERE.COM” and has already obtained some success (for example a GOPro Hero lost at the Millaa Millaa waterfalls in Australia, found and sent to the owner in a week). 4) Look for international online message boards ( such as Craigslist). These virtual spaces could be attended by the person who finds the device. There is almost always a Lost and Found section in these message boards. 5) The best advice is always to do a daily backup of photos and videos, via a cloud or on a second device such as an iPad. Alternatively carry with you some SD Cards to change weekly or when you consider the gathered material particularly precious. If the device is lost you will surely miss it but the pictures will still be with you. 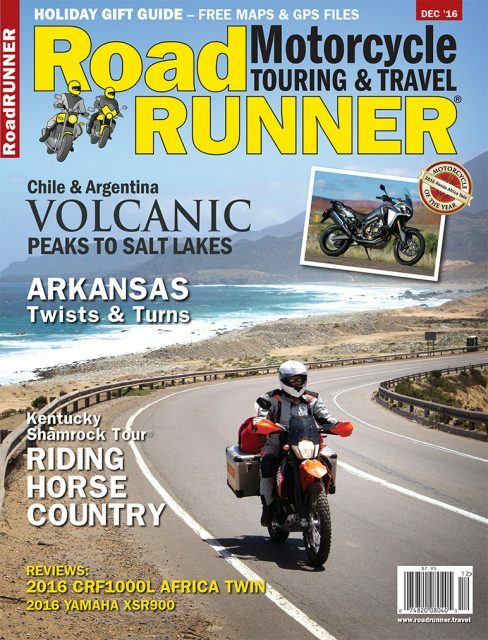 Print and digital subscriptions for RoadRUNNER magazine are available at http://www.roadrunner.travel. Click here to read an entire digital issue for free, compliments of RoadRUNNER. AS FAR AS THE BLACK SEA... AND THEN ROUND THE WORLD!